An Alumni of Sophia College and a B.Sc. Graduate in Law and M.A (Sociology). Ms. Rudy represented Rajasthan in women cricket at all India as wicket keeper. She has worked in Indian Airlines for 14 years. 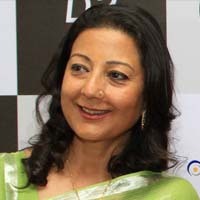 She was also a certified instructor on Boeing 737 and ATR-200 aircrafts, Worked at the Indian Airlines as Chief of In-flight Services all India. Keeping good ethics, when her husband took over as Minister of Civil Aviation, she left her job. After quitting, she took upon golf and has won several cups and trophies at amateur level. She has been the organizer of Precious Golf Cup tournament annually. She has also been working for charities esp. women issues of security, homeless girls, and elder of society and presently for low cost sanitary napkins for rural adolescent girl child.